The French Revolutionary Army (French : Armée révolutionnaire française) was the French force that fought the French Revolutionary Wars from 1792 to 1802. These armies were characterised by their revolutionary fervour, their poor equipment and their great numbers. Although they experienced early disastrous defeats, the revolutionary armies successfully expelled foreign forces from French soil and then overran many neighboring countries, establishing client republics. Leading generals included Jourdan, Bonaparte, Masséna and Moreau. The Reign of Terror, or The Terror, is the label given by most historians to a period during the French Revolution after the First French Republic was established. Liberté, égalité, fraternité, French for "liberty, equality, fraternity", is the national motto of France and the Republic of Haiti, and is an example of a tripartite motto. Although it finds its origins in the French Revolution, it was then only one motto among others and was not institutionalized until the Third Republic at the end of the 19th century. Debates concerning the compatibility and order of the three terms began at the same time as the Revolution. It is also the motto of the Grand Orient de France and the Grande Loge de France. The Declaration of Pilnite, more commonly referred to as the Declaration of Pillnitz, was a statement issued on 27 August 1791 at Pillnitz Castle near Dresden (Saxony) by Frederick William II of Prussia and the Habsburg Holy Roman Emperor Leopold II who was Marie Antoinette's brother. 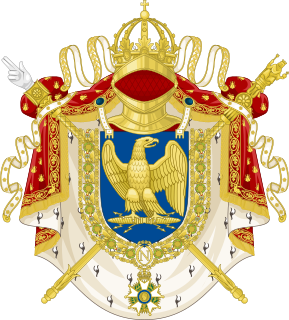 It declared the joint support of the Holy Roman Empire and of Prussia for King Louis XVI of France against the French Revolution. Almost all of the ancien regime officer class had been drawn from the aristocracy. During the period preceding the final overthrow of the Monarchy, large numbers of officers left their regiments and emigrated. Between 15 September and 1 December 1791 alone 2,160 officers of the royal army fled France  eventually to join the émigré army of Louis Joseph, Prince of Condé. Of those who stayed numbers were either imprisoned or killed during the Reign of Terror. The small remaining cadre of officers were promoted swiftly; this meant that the majority of the Revolutionary officers were far younger than their Monarchist counterparts. Those high-ranking aristocratic officers who remained, among them Marquis de la Fayette, Comte de Rochambeau and Comte Nicolas Luckner, were soon accused of having monarchist sympathies and either executed or forced into exile. Nicolas, Count Luckner was a German officer in French service who rose to become a Marshal of France. Realizing that the army was not capable of conforming with the 1791 Reglement, commanders began experimenting with formations which required less training to perform. Many eminent French military thinkers had been clamoring for change decades before. In the period following the humiliating performance of the French Army during the Seven Years' War, they began to experiment with new ideas. Guibert wrote his epic Essai général de Tactique, Bourcet focused on staff procedures and mountain warfare, and Mesnil-Durand spent his time advocating l'ordre profond , tactics of maneuvering and fighting in heavy columnar formations, placing emphasis on the shock of cold steel over firepower. After the initial dismal performance of the Fédéré volunteer battalions, Carnot ordered that each demi-brigade was to consist of one regular (ex-Royal Army) and two fédéré battalions. These new formations, intended to combine the discipline and training of the old army with the enthusiasm of the new volunteers,  were proven successful at Valmy in September 1792. In 1794, the new demi-brigade was universally adopted. François Christophe Kellermann or de Kellermann, 1st Duc de Valmy was a French military commander, later the Général d'Armée, a Marshal of France and a freemason. Marshal Kellermann served in varying roles throughout the entirety of two epochal conflicts, the French Revolutionary Wars and the Napoleonic Wars. Kellermann is one of the names inscribed under the Arc de Triomphe, on Column 3. A demi-brigade is a military formation used by the French Army since the French Revolutionary Wars. The Demi-brigade amalgamated the various infantry organizations of the French Revolutionary infantry into a single unit. Each one was headed by a chef de brigade. Auguste Marie Henri Picot de Dampierre, styled the Marquis de Dampierre and usually known as Dampierre, was a French general during the time of the French Revolution. He served in many of the early battles of the French Revolutionary Wars, and was killed in action in 1793. For him, the name Dampierre is among those inscribed on the Arc de Triomphe. 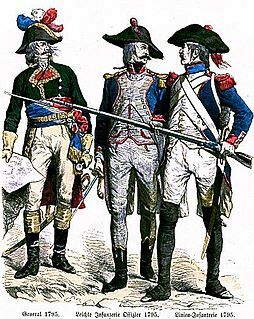 The Army of the Moselle was a French Revolutionary Army from 1791 through 1795. It was first known as the Army of the Centre and it fought at Valmy. In October 1792 it was renamed and subsequently fought at Trier, First Arlon, Biesingen, Kaiserslautern, Froeschwiller and Second Wissembourg. In the spring of 1794 the left wing was detached and fought at Second Arlon, Lambusart and Fleurus before being absorbed by the Army of Sambre-et-Meuse. In late 1794, the army captured Trier and initiated the Siege of Luxembourg. During the siege, the army was discontinued and its divisions were assigned to other armies. The Battle of Arlon saw a French Republican force under the command of Amable Henri Delaage face a Habsburg Austrian force led by Gottfried von Schröder. The French were victorious though they suffered higher casualties than the Austrians. The action was fought during the War of the First Coalition, part of the larger French Revolutionary Wars. Arlon is located in Belgium, a distance of 30 kilometres (19 mi) west of Luxembourg city. The 102nd Infantry Regiment was an infantry regiment of the French Revolutionary Wars and the Napoleonic Wars. Jean René Moreaux commanded the French Army of the Moselle during the French Revolutionary Wars. He joined the French Royal Army in 1776 and was badly wounded in the American Revolutionary War two years later. After leaving military service, he married and took over the family business. At the time of the French Revolution he was elected second in command of a volunteer battalion. He was rapidly promoted, emerging as a general officer in May 1793. After another promotion, he led a corps at Pirmasens and a division at Wissembourg. He was appointed commander of the Army of the Moselle in June 1794. In November he was sent with three divisions to invest the fortress of Luxembourg. He caught a fever and died during the Siege of Luxembourg. His surname is one of the names inscribed under the Arc de Triomphe. Jean-Baptiste Cyrus de Timbrune de Thiembronne, Comte de Valence commanded French troops during the French Revolutionary Wars and the Napoleonic Wars. A nobleman, he joined the French Royal Army as a captain of cavalry in 1778. By the time of the French Revolution he commanded a cavalry regiment. Valence led troops at Valmy in 1792 and was soon appointed to command the Army of the Ardennes. He led the right wing at Neerwinden. Becoming involved in Charles Francois Dumouriez's failed plot to seize control of the army, he defected in April 1793. Antoine Digonet commanded a French brigade during the French Revolutionary Wars and Napoleonic Wars. He joined the French Royal Army and fought in the American Revolutionary War as a foot soldier. In 1792 he was appointed officer of a volunteer battalion. He fought the Spanish in the War of the Pyrenees and was promoted to general officer. Later he was transferred to fight French royalists in the War in the Vendée. In 1800 he was assigned to the Army of the Rhine and led a brigade at Stockach, Messkirch and Biberach. Shortly after, he was transferred to Italy. In 1805 he fought under André Masséna at Caldiero. He participated in the 1806 Invasion of Naples and led his troops against the British at Maida where his brigade put up a sturdy resistance. After briefly serving in the 1809 war, he took command of Modena and died there of illness in 1811. He never married. Balthazar Alexis Henri Schauenburg, was a French general who served in the wars of the French Revolution and the Empire. He briefly commanded the Army of the Moselle in 1793 during the War of the First Coalition. A nobleman, he joined the French Royal Army as a sous-lieutenant in 1764. The French Revolution led to rapid promotion and then to arrest for the crime of being an aristocrat. Later restored to command, he commanded Kehl in 1796 and invaded Switzerland in 1798. He served in Jean Victor Marie Moreau's army in 1800 and held commands in the interior under the First French Empire. He retired from the army in 1814 and died in 1831. Schawembourg is one of the names inscribed under the Arc de Triomphe, on Column 23. Amédée Willot held several military commands during the French Revolutionary Wars but his association with Jean-Charles Pichegru led to his exile from France in 1797. He joined the French Royal Army as a volunteer in 1771 and was a captain by 1787. He was elected commander of a volunteer battalion in 1792 and served in the War of the Pyrenees. Shortly after being promoted commander of a light infantry regiment Willot was appointed general of brigade in June 1793. A few months later he was denounced as a Royalist and jailed. In the light of later events, this may have been an accurate assessment of Willot's sentiments. After release from prison in January 1795, he led troops in Spain during the summer campaign. He was promoted to general of division in July 1795. Jean Étienne Philibert de Prez de Crassier or Étienne Desprez-Crassier was a French politician and army commander in the early years of the French Revolutionary Wars. Despite being from the minor nobility, he entered the French Royal Army as a cadet at the age of 12 because of his family's poverty. He fought in the War of the Austrian Succession and the Seven Years' War, becoming a colonel in 1785 and retiring two years later. Voltaire lent him the money needed to recover the Deprez family property. He was elected to the Estates General as a nobleman in 1789. After being promoted to lieutenant general he led a division at Valmy in 1792. He became commander of the Army of the Rhine and Army of the Western Pyrenees. Imprisoned during the Reign of Terror, he was released and restored to his former rank but retired in 1796. Jean-Baptiste André Isidore Ruault de La Bonnerie became a French general officer early in the War of the First Coalition and later emigrated to Habsburg Austria under which he also was a general. He joined the French Royal Army in 1760 and became a general of brigade in 1792. He commanded the French defenders during the 1792 Siege of Lille. After fighting at Maastricht and Neerwinden he followed Charles François Dumouriez and other generals in defecting to Austria. He entered Habsburg service as a colonel and became a General-major in 1804. He died in 1817 at Graz. The Régiment Royal des Vaisseaux was an infantry regiment of the Kingdom of France created in 1638. The Battle of Maudach occurred on June 15th 1796, between the French Revolutionary Army and the Army of the First Coalition. This was the opening action of the Rhine Campaign of 1796 on the Upper Rhine, slightly north of the town of Kehl. The Coalition, commanded by Franz Petrasch, lost 10 percent of its manpower missing, killed or wounded. It was fought at the village of Maudach, southwest of Ludwigshafen on the Rhine river opposite Mannheim. Maudach lies 10 km (6 mi) northwest of Speyer and today is a southwest suburb of Ludwigshafen; a principal town on the Rhine river in 1796. Jean-Chrysostôme Calès was a French military officer who served during the French Revolutionary Wars and the Napoleonic Wars. He was born on January 27, 1769 in Caraman (Haute-Garonne) and died on April 21, 1853 in Cessales (Haute-Garonne). The 99th Infantry Regiment was an infantry regiment of the French Army. It was formed in 1791 by renaming the Royal Deux-Ponts Regiment and fought in the French Revolutionary Wars before being merged into another unit in 1803. A new and unrelated 99th Infantry Regiment was formed in 1855 and took on the traditions of the previous regiment. Henri Rottembourg became a French division commander late in the Napoleonic Wars. He enlisted in an infantry regiment of the French Royal Army in 1784 and was promoted to first lieutenant by 1792. During the War of the First Coalition from 1793 to 1797 he fought mostly in the Army of Sambre-et-Meuse. He was wounded at Verona in 1799 and fought on the Var and at the Mincio in 1800. He transferred to the Imperial Guard in 1806 before fighting at Jena and being named to command an infantry regiment. In 1809 he was wounded at Wagram. François Roguet became a French division commander in the Imperial Guard during the Napoleonic Wars. He enlisted in the French Royal Army in 1789. His regiment was assigned to the Army of Italy in 1792 and fought in the Italian campaigns of the French Revolutionary Wars. He commanded a battalion at the Battle of Rivoli in 1797. He was badly wounded at the Battle of Verona in 1799. For suppressing partisans he was promoted to command an infantry regiment. ↑ Cobb, Richard (1987). The People's Armies. New Haven: Yale UP. ISBN 0300040423.